A 'millennium generation' of 14 and 15 year olds are the most technology-savvy in the UK, according to a new Ofcom report, which shows that after digital confidence begins a long decline beyond teenage years. Teens born at the turn of the millennium are unlikely to have known 'dial-up' internet and are the first generation to benefit from broadband and digital communications while growing up. The research, part of Ofcom's eleventh Communications Market Report, measures confidence and knowledge of communications technology to calculate an individual's 'Digital Quotient' score, or 'DQ', with the average UK adult scoring 100. The study, among nearly 2,000 adults and 800 children, finds that six year olds claim to have the same understanding of communications technology as 45 year olds. It shows that we hit our peak confidence and understanding of digital communications and technology when we are in our mid-teens; this drops gradually up to our late 50s and then falls rapidly from 60 and beyond. The study helps support Ofcom's duty to research the markets it regulates and better understand people's technology literacy. As a result of growing up in the digital age, 12-15 year olds are developing fundamentally different communication habits than older generations, even compared to the advanced 16-24 age group. 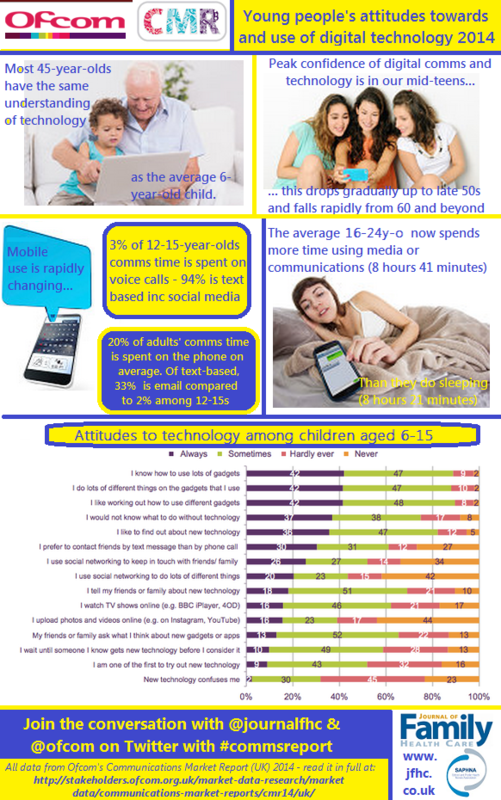 Children aged 12-15 are turning away from talking on the telephone. Just 3% of their communications time is spent making voice calls, while the vast majority (94%) is text based - such as instant messaging and social networking. By contrast, 20% of UK adults' communications time is spent on the phone on average. While adults also embrace digital text-based communications, the traditional email is most popular (used for 33% of their time spent communicating) compared to just 2% among 12-15s. Among the adult population, it's the 16-24s who spend the most time on media and communications. They're cramming over 14 hours of media and communications activity into 9 hours 8 minutes each day by multi-tasking, using different media and devices at the same time. While tablet use is spread across generations, smartphone ownership differs greatly by age. Almost nine in ten (88%) of 16-24s own a smartphone, compared to 14% among those aged 65+. These young adults are glued to their smartphones for 3 hours 36 minutes each day, nearly three times the 1 hour 22 minute average across all adults. Ed Richards, Ofcom Chief Executive, said: "Our research shows that a 'millennium generation' is shaping communications habits for the future. While children and teenagers are the most digitally-savvy, all age groups are benefitting from new technology. "We're now spending more time using media or communications than sleeping. The convenience and simplicity of smartphones and tablets are helping us cram more activities into our daily lives."